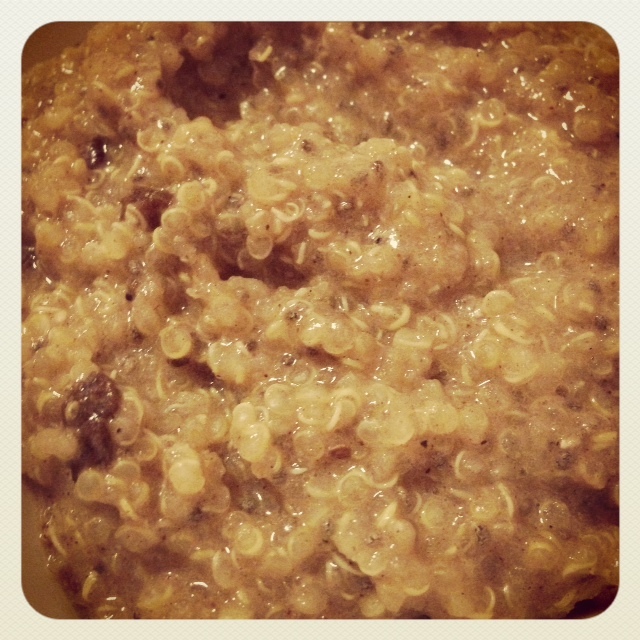 Yesterday I came across this recipe from Eating Well, Spiced Breakfast Quinoa. Given it’s summer and all, I haven’t been eating hot breakfast much these days. But the spices made me think of fall, and it is almost that time (sorry guys, but we need to come to terms with it and it’s not like I’m busting out the pumpkin recipes…yet). You can omit the egg white if you want to make this vegan. Add quinoa, almond milk and water to a medium saucepan – cook on medium-high heat. Then stir in cinnamon, nutmeg, ginger and salt and bring to a boil. Reduce heat to maintain a simmer and cook uncovered, stirring occasionally, until the quinoa is tender, about 20-25 minutes. Remove from heat, then stir in honey and vanilla. Whisk egg white in a small bowl with 1 tablespoon of the hot cereal. Repeat with 5 more tablespoons until the egg white is completely incorporated, then add in raisins. Return the cereal to the saucepan and cook, stirring, over medium-low heat until thickened slightly, 1 to 2 minutes. Remove from heat and add chia, stir thoroughly. I made this ahead least night to enjoy this morning since it does take some time to prep. I will definitely be enjoying it again tomorrow morning! You can eat this cold or hot – so it’s totes summer friendly! Plus it’s loaded with protein, fiber, magnesium, folate, calcium and potassium. And, if you really love quinoa for breakfast, you can also try my Quinoa Apple Cereal or my Dark Chocolate Banana Quinoa Pancakes OR my Lemon Blueberry Quinoa Pancakes. What’s your favorite breakfast recipe involving quinoa? wow, looks yummy! I am going to make this soon. Thanks!